Push the boundaries of your large format printing with the Océ ColorWave 500 printing system, a monochrome and color printer, scanner, and copier in one convenient single footprint. Gain a competitive edge with distinctive high-quality drawings and presentations without the need for expensive coated paper. Save greatly on space, supplies, and maintenance by using one system for both color and monochrome work. With its intuitive design, the Océ ColorWave 500 printer is one of the easiest to use walk-up printers in the market today. Produce up to 225 D-sized monochrome and color prints per hour – to meet a rush deadline without breaking a sweat. This system can hold up to four media rolls and prints come out dry, cut-to-size, and ready to use. World-class printing speeds of up to 225 D size prints per hour. Handles applications including B&W and color CAD, GIS and full color graphics on plain paper. Instant-dry prints ready for immediate use. 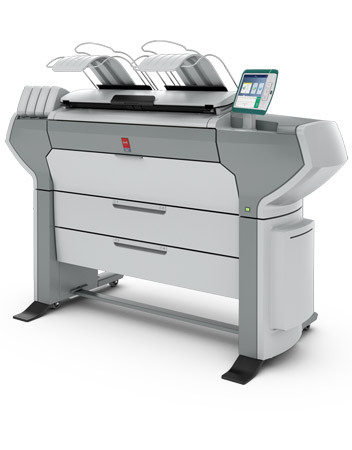 Unique Océ MediaSense technology allowing for consistent results with each print, even among multiple print engines. Optional online folder, offering different folded packages that can be prepared and printed right from your desktop. Flexible media choices including bond, film, waterfast Tyvek, polypropylene and recycled paper.